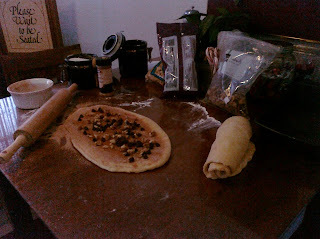 After class I came home and wanted nothing more than to bake a few things and veg out playing Dragon Age. So that's basically what I did. While the bread machine worked on some cinnamon roll dough I wandered around the cavernous halls of Orzammar in Dragon Age. When the dough was finally complete, I took a break and created some tasty cinnamon rolls. 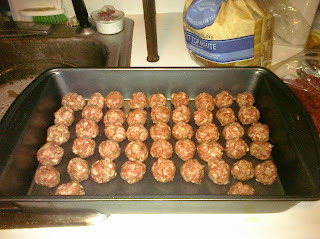 Later I tried my hand at a recipe I'd stumbled across in my google reader for tiny meatballs in a cream/milk sauce. The meatballs tasted fine, but the rest was meh. In between all of that Chris's receiver died, so we went out and snagged another one. So now we have lovely surround sound again just in time to watch the latest Caprica (which, technially, aired on Friday but hooray for the magic of DVR!). Saturday Chris and I headed out to visit his good friends Adam and Comfort (The Uniques). 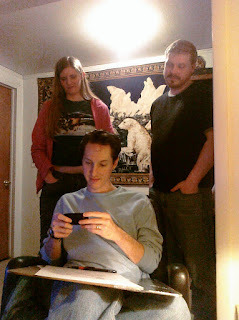 It's been awhile since we've seen them in person (though luckily Chris is able to Skype with them roughly weekly). It was great to finally see their pad in person as opposed to video. Now, since the Palm Pre recently released WebOS 1.4, the cell phone can now record video. This meant Chris was able to shoot some nice video of our trip out there as well as when we first arrived and a walk we took together. If you didn't know, the house Adam and Comfort live in is connected to Adam's parents house - which meant awesome drop-ins from his parents with tasty cookies and creamy, minty, hot chocolate. That, plus the adorable two dogs they have (combined with Adam and Comfort's very adorable kitties) was very amusing for me. We were able to watch a few shows, and chat it up for quite a while on a range of topics from comics, to politics, to video games and anime. I really enjoy visiting with them. They're an amazing couple with amazing dedication to their work. That, combined with the sheer awesomeness of their personalities makes any visit with them entertaining. Another cold day in Grand Rapids. 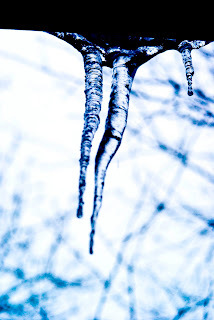 The weather spent most of the day flipping back and forth between snow and ice/rain most of the day. So when I arrived home from work for the day, I didn't really have any intent to leave. So instead I cracked a tasty bottle of cherry wine from a winery in Traverse City, turned on some music, and hung out, playing with my SLR for a bit. Admittedly, Leki was less than impressed. He spent a chunk of the evening wondering why I wouldn't sit with him while he wanted to eat, and why I cared about anything going on outside on the balcony since there were no squirrels or birds around. Overall it was a very good night. Leki is officially 2 years old today. That might not sound like much, in fact it's not really much in the scheme of things - but it marks 2 years of owning a cat. 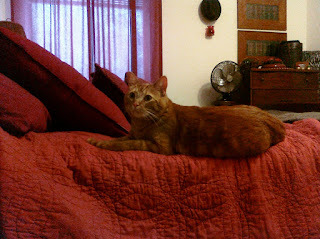 And a very cuddly, curious, orange cat at that. Leki (aka Meow Meow) was 5 weeks old when I got him from a family in Greenville. I nearly got him at 4 weeks, they were so anxious to be rid of all the kittens! And at 5 weeks Leki was still not fully weaned. He milked all sorts of tassles, wouldn't use the litter pan unless I was present for months. It was adorable but obvious he'd left his mother too young. 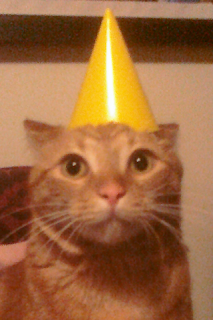 Fast forward 2 years and it's time to celebrate the birthday of a kitty who loves to be involved in anything you're doing - at any cost. Obviously from the picture we put on the obligatory party hat (photo courtesy of Chris). We then put some candles in his birthday food (not sure he was impressed). Once those were removed and we were done singing (yes, we totally sang the cat happy birthday), he came over to check out the food. Finally we chopped it up and he dug in. After he stopped eating he spent another 10 minutes or so just purring loudly. Loving all of the food and attention. 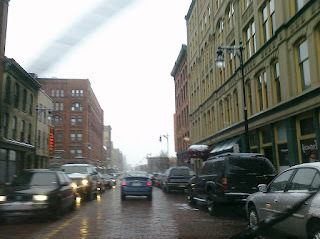 Another snowy day in Grand Rapids. Admittedly, today was not as bad as previous days, but it still snowed on and off most of the day. Since its Wednesday, I had class. Which meant driving downtown. By the time I hit downtown thought, there didn't appear to be much snow. However, during my drive to class on the freeway big fat snowflakes fell. Leki is a curious cat. He loves investigating new things brought into the apartment, new locations, new people. He insists that he does all these things without constraints and human intervention - which is why he'll often let out an ineffective hiss if he's being transported or prevented from getting at that shiny new object. So when the cable guy showed up in the evening, Leki needed to see what that dude was doing. There were things being moved, new contraptions being revealed. It was all very interesting. This of course meant Leki needed to be sequestered elsewhere. Now he's not a fan of being locked away when there is activity going elsewhere. Even if the activity is scary - he still wants the ability to peek around the corner and see it. So while I sat with him in the bedroom it took a good 10-15 minutes for him to finally settle down after alternating between scratching the door, scratching the carpet, and meowing occassionally. Eventually he migrated to sitting patiently in front of the door. When the door finally opened - ZOOM - into the living room! And since the cable guy was gone, that meant investigating all the areas he had been. Sometimes Leki is very dog-like. Sometime between when we got home last night and when we got up in the morning it snowed a bit. The drive to work was like it usually is on snowy days - snowy. The snow didn't really taper off until the afternoon. In the evening when I got home I started on Swedish meatballs. Normally you fry them in a pan with butter, but I always ruin their shape that way so this time I thought I'd try baking them. Turned out well. Even Leki was looking forward to dinner. After I got out of class on Sunday, Chris and I headed over to my friend's house (Kati & John) to celebrate their youngest daughter's 3rd birthday, which occured earlier in the month. Per usual, a large chunk of my adopted family was there. I got to catch up with Kati & John, her cousins, aunts, parents, grandparents, and siblings. Going to events with her family is like seeing my family. 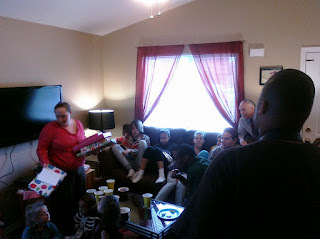 So it was good to see everyone and see how much bigger all of the kids had grown in the past few months. The old CRT HDTV has been steadily making a louder and louder whine. It finally reached the point where I was avoiding using it because it seemed to be loudest whenever I tried to play any video games. We had been thinking that we would need to replace the TV eventually, and I'd had a flatscreen in the back of my head for years but kept putting it off. So finally we decided Saturday to get serious about it. After I met an old co-worker for lunch we headed out to the stores. We had previously researched a bit online and had a few places to check out. Naturally, each store we hit we did even more research on our phones. Eventually we decided on an 37" LCD. I had originally wanted to go higher - but Chris is right. That's plenty big for the space we have and really it still seems huge. Moving the LCD was a lot easier than lugging around the old CRT 30" (now to figure out a way to get the old TV out of the apartment). So bonus! Of course, with a new item means new packaging, new boxes. And Leki was very excited to hang out and enjoy everything. 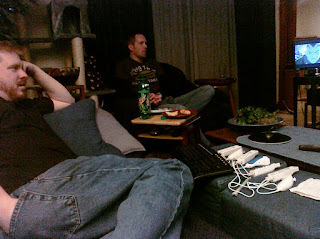 Friday evening Chris & I headed over to his friend Jeff & Stephanie's house to play some video games. Most of the crowd is composed of fans of the ever popular Rock Band, which afforded me an amusing evening watching people swap instruments and sing away. 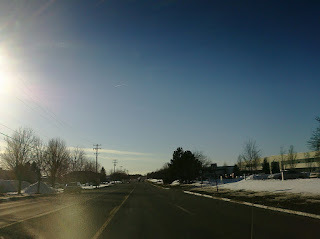 Today I had a meeting in Farmington Hills for work, so when I left in the morning at 6:30, the skies were dark and grey. I spent large chunk of the morning sequestered in an office without looking outside. So it was refreshing to see blue skies for the drive home. Looking forward to more days like this and less overcast, snowy days. 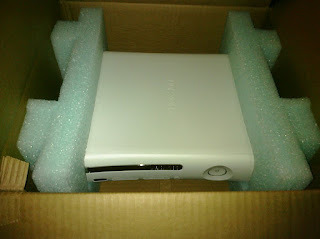 Chris and I ordered a refurbished XBOX 360 last week. On Wednesday it arrived and we unboxed it, hooked it up, and waited patiently for the loading splash screen. The little spinning green lights around the power button stopped spinning and turned to red. Blinking red. 3 quandrants. We disconnected and reconnected everything. Same thing. We tried it again. Same thing. I knew about the red ring of death on XBOXes but I thought all four areas had to be lit up. So I researched a bit online and found a breakdown of what all the different blinking red combinations meant. Turns out our newly received, refurbished machine had arrived with the red ring of death (RROD). So I called Microsoft who were helpful and dispatched a shipping label so that I'm able to get the console repaired. 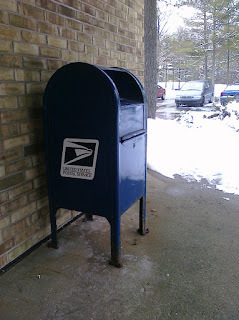 Roughly 2-3 weeks from when they receive it. It's not like Chris and I will *miss* the system, since we never used it. It's more of an annoyance that you purchase a refurbished item (that is - it's supposed to be repaired) only to have it dead on arrival. You don't always maintain relationships with people after you've both left your place of employment. Life gets in the way - even if you try. Now that's not always the case - but it happens freqently. Especially if you're married and have children. So that is why it's pretty awesome that I'm still in contact with several people I still work with. We're all from different stages in life, and grew up in different places - so we bring different persepctives to the table. So last night I hung out a lady I used to work with and the ever growing "ladies night" crowd and tonight I got to hang out with another woman. A few current co-workers stopped in to join us and the evening was great. They were even kind enough to hang out with me until I needed to pick Chris up from the airport around 10:30ish at night. This evening after work I went out and met the ladies at Cabana Tres Amigos. 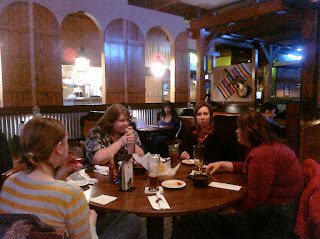 We enjoyed some Mexican food, drinks, and each other's company. 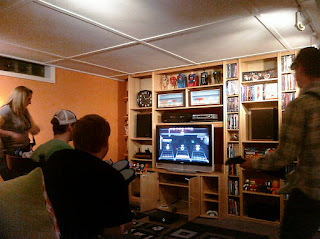 It's been awhile since we've all gotten together, so it was nice to see everyone enjoying themselves and unwinding. I have classes Sunday mornings - and today was no exception. Some classes (like 5 total out of 90 credits) have midterms, and my Sunday class happens to be one of those classes. So this AM was a midterm for Criminal Law, a lecture, then home for some lunch. After that Chris and I ran quickly over to Meijer so he could pick up some last minute provisions. He's taking a business trip down to Florida for a convention and his flight leaves in the afternoon. 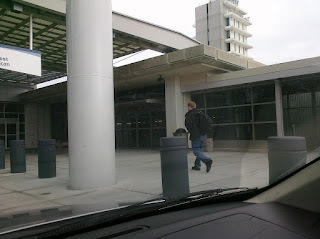 So in the middle of the afternoon, 2:30ish, we left so I could drop him off at the airport in Grand Rapids. After that I headed home and have a lazy afternoon/evening mapped out of video games and snuggling with Leki and my new cute stuffed dragon. So since really we only had a few hours to hang out but ALL day yesterday - celebrating that pink holiday a day early worked out just fine. Work was relatively quiet and uneventful. 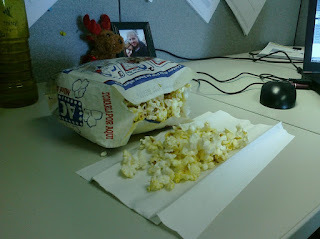 A lot of people worked from home so I didn't really feel bad making some popcorn for lunch. Normally I try to not do it since its a pretty fragrant food that permeates throughout the office. I had picked up some mini-popcorn bags the other day while I was out on lunch. They're cute and a decent serving size. Smaller, of course, than a usual bag. Which, honestly, is too much for me to eat. I'm not going to lie - I spent the better part of Thursday excited about the evening. There weren't any major plans, no events going on. Just a relaxing evening together with Chris. And it was just that. 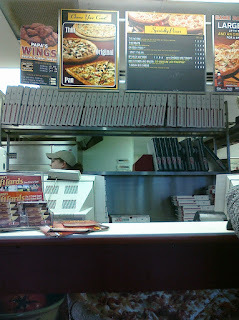 I snagged a pizza for the evening and away I went! It was a great night. Can't wait to have a relaxing Friday night and Saturday. I worked from home on Wednesday so it was a pretty quiet day. I managed to get quite a bit done; presentations, spreadsheets, and other miscellaneous things that have been piling up. On lunch I took a little walk over to the mailbox down the street. It was a nice walk and the day was a little warmer than the day before. Another quiet day - this time I suspect due partially to the snow muffling any murmurings in the office. 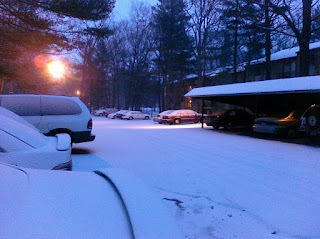 When I left for the day there was a dusting on the cars and it was coming down, fine and consistent. When I was at work I snapped at shot around 9am and you could still see grass poking out. Then around 12pm it was getting thicker. By 3:30pm you couldn't really see the snow. Unfortunately, the photos don't do justice to the mini-drifts that were piled against windows, doors, and encircled cars. Apparently around 8" fell near the airport (GRR), which is only a few miles from my work. Monday was quiet. A lot of people were still out of the office for vacation, recent births in the family, or out in the field working. So the day was relatively low key. 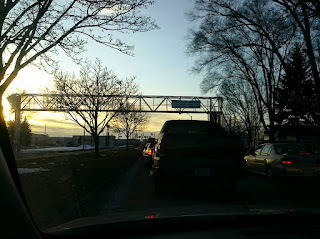 On my way home traffic was backed up for a little bit, simulating what rush hour would be more like back when I lived in the metro Detroit area. Turns out the problem was a train that had come to a complete stop on the tracks. After another 10 minutes or so the train finally started moving and traffic was able to get by. I was pretty lazy today. I got up, went to class, then came home and played Dragon Age on and off most of the day while Chris worked on The Uniques website. I played Dragon Age, then took a nap, then played Dragon Age, then took a walk, then played Dragon Age and finally ate some dinner. It was a pretty Dragon Age heavy day (a part of me is trying to cram in some gaming before classes get more intense AND some newer RPGs come out). It wasn't until the evening that I realized I needed some clean socks and other miscellaneous items. 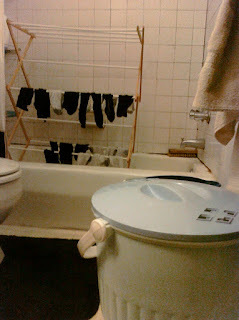 So I utelized Chris's awesome little washer thingie and started laundry around 9:30. After that we stayed up a bit to watch some Super Bowl ads after the game was over (neither of us are interested in football - so neither of us watched the game) on their website. Was a pretty decent day, even if it was super lazy on my part. I needed to get a few things done this Saturday AM, so Chris and I got up and out of the apartment in the morning. Ran around to some banks, did some grocery shopping, even saw the weird Strawberry Shortcake character redesign I'd read about. 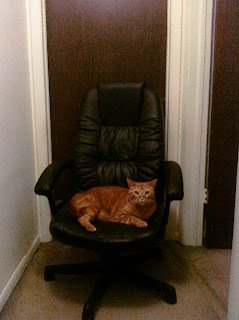 In the afternoon Leki got finally got booted out of the office where the bird was by way of wheeling "his" chair into the hallway. In the evening we cooked a lot of things. Chicken Cordon Bleu, chili, brownies, and even some pesto (thought I use pine nuts) to freeze for later. 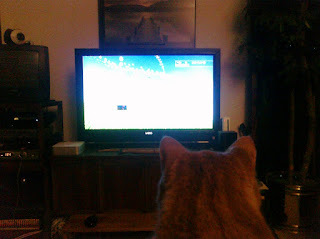 In the evening the cat and ferret got to play a bit, though Peppy did most of the running around and playing. All in all it was a pretty well rounded day. Some chores were done, some relaxing was had. It was a good Saturday. It was a pretty quiet day. 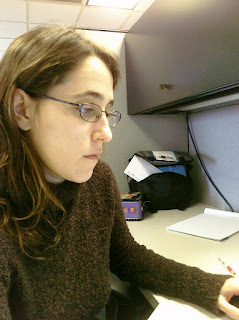 A lot of people were out of the office or in the field, so not a whole lot of buzz occured in cubical-land. I was able to get the remainder of my homework completed on my lunch break, which freed up my evening and weekend for virtually whatever I wanted. I think we have a republican cat. Thursday was cold. I was cold at work. I was cold at home. 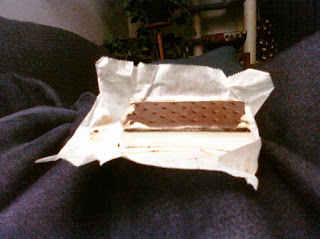 So why not warm up with a tasty ice cream sandwich? Yeah...I know. Tuesday started off ok. 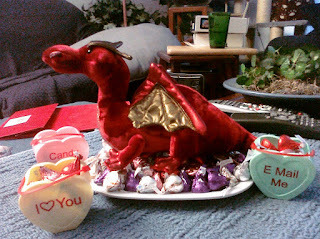 I had a frustrating project that needed tackling at work in the AM and by the PM I was in desperate need of chocolate. But the evening rolled around and it was fantastic. 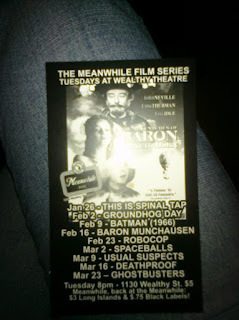 Chris and I headed over to Wealthy Theatre and watched the awesomeness that is Groundhog Day. Which, of course, is appropriate since today is Groundhog Day. There was a fair amount of buzz about today being "Bill Murray" day, no doubt in honor of the movie, on my twitter. Links to blogposts and well wishing for a "happy Bill Murray day" all throughout the day. Very amusing. As a bonus - the lineup at the Wealthy Theatre for the next several weeks looks awesome! We are totally continuing the awesome theatre going with Batman next week. Likely Chris and I will see most of these movies over the next several weeks. Its a fun thing to do and an easy, cheap "date" night. If you're in the area and free, you should totally check out the theatre. Only $5/person and its a pretty neat, old looking theatre. After work I joined Chris for his weekly meet up with Adam and Comfort (The Uniques) to watch an Avatar Review by Red Letter Media, who did the fantastic (and hilarous) review of Star Wars Episode 1. We used Skype, since Adam and Comfort live on the other side of the state. It was great to hear how their experience was at a convention, and great to hear things are going well with their comic, The Uniques. All in all a good end to an otherwise blah day.